Susan Robb was the bassist and singer for Incredible Force of Junior (1992- 1998), an art-punk, tweecore trio along with Chris Munford (guitarist, singer) and Steve Lodefink (drummer). As a child Susan’s older brother Mike introduced her to Frank Zappa, Black Sabbath, Led Zepplin and Pink Floyd. She played piano, flute, violin and susaphone. She was greatly influenced by the tapes and singles sent to her in the early 80’s by a french pen pal. At 16 she began Dj’ing at WCNI, the radio station at Connecticut College. When she was 18, Susan met Chris Munford at Syracuse University where they had an instant repore around music. They began writing, playing, and recording together – Susan singing and Chris playing guitar, under the name Sweet Like a Boy. After graduation Susan and Chris slowly drove across the US in a early 70’s VW bus. Soon after they arrived in Seattle they met Steve at a party and began practicing in Steve’s basement. Susan also began grad school at the University of Washington (where she obtained an MFA in photography). A few months after their initial meeting Incredible Force of Junior (their name is a mishearing of a NYC double dutch team named Incredible Foursome Junior) had a gig opening for Super Chunk at Rock Candy. In 1994 they self-produced a single, Greatest Thing/Jet Propulsion, on their own Swing-Set label which received positive reviews and was played on BBC’s John Peel Show. 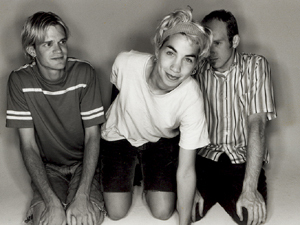 In 1994 Cher Doll Records also released a 7″ (Stronger/Johnathan Richman’s Walter Johnson recoreded live by Doug Haire for KCMU’s “Live Room”); in1995 Up Records released the single Blue Cheer/Driving In You Car produced by Phil Ek; and Paper Cut records released a split single with Wimp Factor 14, The Nonpareils, and Belmondo. Incidentally “Freaks” the song that appears on that record was recorded in 1992 and one of the first songs Susan and Chris wrote as Incredible Force of Junior. In 1996 Up Records released I.F.O.J.’s full length album, Let The World Fall Apart, also produced by Phil Ek. I.F.O.J toured in support of that record including shows at the Frying Pan and CMJ. In 1999 they disbanded because of personal and professional reasons. In 1998 Susan began writing new material and performing as Goatmax1, a performance art/hip hop hybrid, where she dressed as a dead, new-wave ballerina, created stage installations, performed stand-up, and invited friends to act out interpretations of her songs. Chris Munford recored a number of these songs but because of tensions between the Munford and Robb they were never released. In 2003 Goatmax1 played a show at the all- ages venue VERA Project during which Susan and her friends made and threw peanut butter and jelly sandwiches at the audience and where one friend took off a lab coat he was wearing to reveal fishnet stockings and no underpants. She and the rest of her crew were asked to never return. Concurrently Susan began to focus more deeply on creating temporary, site-responsive, and socially-engaged art, a path that she follows today. Her work is an ongoing investigation of people, place and our search for utopia. In her early works, interactive sculptures such as Sonitus Mirible Inventi, You Are My Zooplankton – Come Closer, and Seedling, Susan incorporated soundtracks she composed using Casio keyboards, tape loops, and found sound. In 2005 she had a solo show at Platform, Gallery, Seattle, WA for which she created The Sense of Another Dimension/Mobile Works, a series of field recordings made at the Whitney Biennial that she developed into glitchtronica tracks and then sampled to create downloadable ring tones. Her more recent works: ONN/OF “a light festival”, Sleeper Cell Training Camp, Warmth, Giant Black Toobs, The Long Walk, and Parking Squid depend less on music per se but share with her days in Incredible Force Of Junior that same sense of social engagement and community that being in a band fosters. Susan’s work has been funded by a Pollack Krasner Foundation Grant, two Artist Trust Fellowships, a Stranger Genius Award, a 4Culture Special Projects Grant, and the City of Seattle. In 2013 Susan was a recipient of a Creative Capital grant for Wild Times a project in which Robb will thru-Hike all 2,650 miles of the Pacific Crest Trail. Together with fellow thru-hikers and invited environmental policy makers, activists, poets, and writers, Susan will ruminate about utopia, wilderness, and community in Post-Fordist America.